Murder by Gaslight: The Notorious Patty Cannon. According to the pamphlet Narrative and confessions of Lucretia P. Cannon, published in 1841, Patty Cannon’s father, L. P. Hanly, was the son of an English nobleman who disowned him after L. P. took to drink and secretly married a prostitute. With nothing left for them in England, Hanly and his wife traveled to Montreal where they set up a smuggling operation between Montreal and towns in New York and Vermont. The Hanlys lived a double life, prospering on illegal activities while giving the appearance of a respectable family. All was well until acquaintance named Alexander Payne uncovered their operation and threatened to turn them in. Hanly decided that it was necessary kill Payne, but he was only partially successful—he split Payne’s head with an axe but was captured before he could escape. He was hanged soon after. With her husband gone, Mrs. Hanly returned to her old occupation, opening “a house of entertainment for persons travelling for pleasure.” As her mother had done for her, Mrs. Hanly taught her daughters the arts of deception and as soon as she could, married them off to men of respectability. Her youngest daughter, Lucretia, better known as Patty, was sixteen years old when she married Jesse Cannon (called Alonzo Cannon in the pamphlet), a wheelwright from Delaware, who had taken sick during his visit to the Northcountry. Mrs. Hanly, having ascertained that Cannon was wealthy, nursed him back to health and encouraged a blossoming relationship between Cannon and her daughter. Upon his recovery Mrs. Hanly convinced Cannon to marry Patty and take her with him to Delaware. They settled down on the Nanticoke River, near the Maryland boarder, and had two children. But it wasn’t long before Patty’s evil character emerged and Cannon’s health began to fail again. Within three years Cannon was dead. Many supposed he had died of grief over an unpleasant marriage, but Patty would later confess that she had slowly poisoned him. Without the fetters of a husband, Patty went wild. She gathered a group of ruffians who were perfectly obedient to her will, and began a career in robbery. 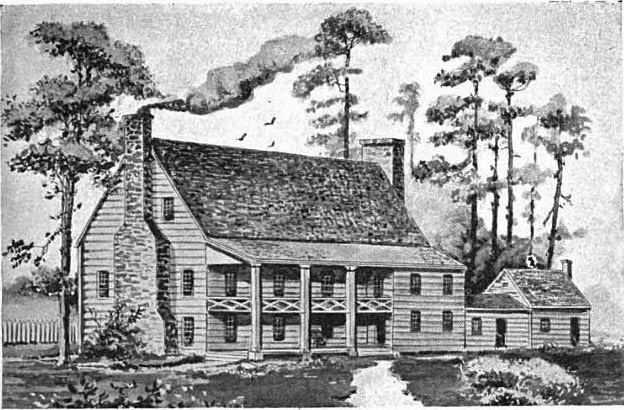 Some time later, Patty and her son-in-law, Joe Johnson, built a house and set up a tavern there, known as “Joe Johnson’s Tavern.” Allegedly, the building straddled the border between Delaware and Maryland so that if authorities entered, she only had to walk a few steps to be in another jurisdiction. When travelers stopped at the tavern, Patty sized them up and if they had anything worth stealing she would shoot or stab them and bury the bodies in the yard. If it was not convenient to kill them on site, she would let them leave, then dressed as a man, she would lead her gang to hijack and murder the travelers on the highway. Her men would later say that Patty had her own graveyard. Delaware was unique before the Civil War, because although it was a slave state, in 1830 only 4% of its population were slaves; 20% of its population were free blacks. This made Delaware an attractive destination for runaway slaves but it was also dangerous for freed slaves who might be kidnapped and sold back into slavery. 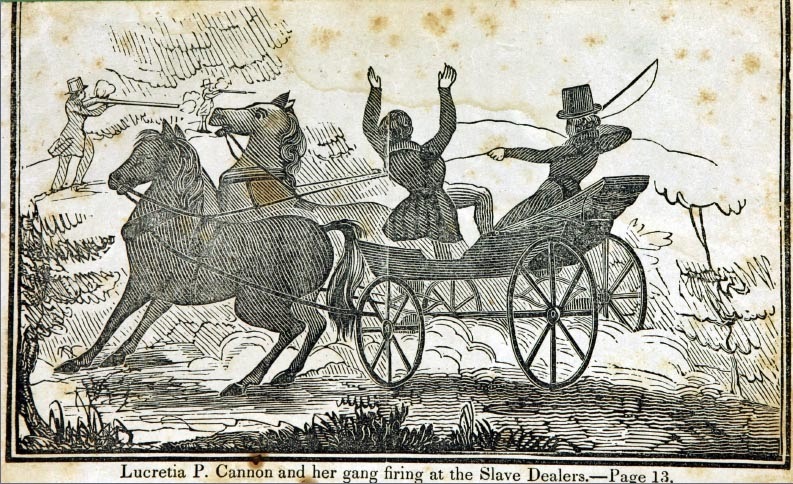 This was the business that ultimately attracted Patty Cannon; kidnapping freed slaves was lucrative and all but risk free. The gang bought a sailing ship to transfer their captives and recruited some black members to help in the work. A black man named Ransom would travel through the city mingling with the free black population, and entice men onto the ship. Once the men were aboard and below decks, the hatches would be secured and the men chained. The ship would travel south where the kidnapped freemen would be sold into slavery. They also worked with a brothel keeper who could supply Patty with black women as well as men. If the women had children, and they were acceptable, they would be sold too. If the children caused trouble they were murdered and buried in a cave in the basement of the tavern. 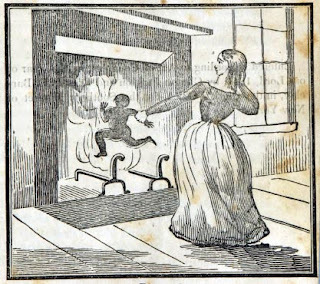 One famous example of Patty Cannon’s cruelty involved a five-year-old child who was subject to fits. During one of the child’s fits, the screaming so angered Patty that she grabbed the child and started beating it. When the screaming continued, Patty held the child’s head over a hot fire, burning its face to a cinder. Patty’s murderous career ended after a traveler who stopped at the tavern for the night and was robbed and killed. When he did not arrive at his destination, suspicions were aroused. While the neighbors were investigating, one of the gang members privately told them there was something awful in the cellar. They took the information to the sheriff who went to the house the following day with a warrant and a dozen armed men. In the attic the sheriff found twenty-one people in chains, awaiting transport to the slave market. They were immediately freed. Patty and all the members of the gang were arrested and taken to Georgetown, Deleware to be tried. One member of the gang turned state’s evidence and told the police where the bodies were buried. Patty and two of her accomplices were convicted of murder and sentenced to hang. Three others were convicted as accessories and each was sentenced to four years in prison. Another version of this story says that the murder of the traveler was not solved until fourteen years later when a field was being plowed and his shallow grave uncovered. After this discovery, Patty was betrayed by a member of her gang. In fact, there is no evidence that Patty Cannon was ever tried for anything. Joseph Johnson was tried for taking a free black man from Delaware to Maryland, but he is the only member of the gang that was ever brought to court. In 1821 an indictment for kidnapping was issued against Joseph Johnson, Mary Johnson, Jesse Cannon, Jesse Cannon Jr., John Stevenson, and Martha Cannon. It is presumed that Martha Cannon was actually Patty Cannon. An indictment, dated April 13, 1829 charged Patty Cannon with the murder of three infants, seven years prior that time. In another indictment of the same date, she is charged with being an accessory to the murder of a boy. She was probably arrested and jailed on these charges. All sources seem to be in agreement that Patty Cannon committed suicide in prison. Narrative and confessions of Lucretia P. Cannon, which claims that Patty was convicted of murder and awaiting execution when she took poison, gives a vivid description of her death. About three weeks before her scheduled execution, the pamphlet states, Patty Cannon obtained some poison in prison. She killed herself to avoid a public execution, the fate that had befallen her father. The poison had a terrible effect; before she died she would alternate between raging fits and remorseful depression. During the fits she would rip her clothes off, tear her hair, destroying everything in her reach, and “cursing God and the hour that gave her birth.” It took three men to keep her on her bed. In her calmer moments she would cry bitterly and reproach herself for the awful crimes she had committed, then the rage would start again. During a calm moment, about an hour before her death, Patty asked for a priest so she could make her confession. She confessed that she had killed eleven people with her own hands and was an accessory to the murder of more than a dozen others. She also admitted to poisoning her husband and strangling one of her own children when only three days old. Then Patty was seized by another fit of despair, she sank back on her pillow and died. 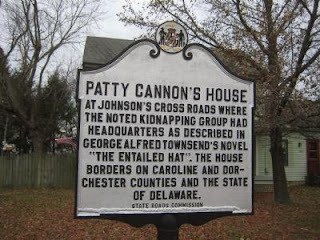 An historical marker in Reliance, Maryland identifies the location of Patty Cannon’s headquarters. However the PBS television show “History Detectives” has determined that the house standing there now is not the original Joe Johnson’s Tavern. They proved that Patty Cannon had owned the property, but the original building was torn down in 1948. This fact is indicative of the confusion surrounding the story of Patty Cannon (aka Lucretia P. Cannon, aka Martha Cannon.) 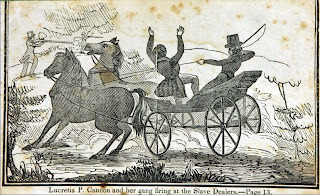 The murder pamphlet Narrative and confessions of Lucretia P. Cannon is the source of much anecdotal evidence on Patty Cannon, but it is sparse on hard facts, such as names of victims and dates of events. It is impossible at this point to know how much of its material is true. Another source adding to the mythology of Patty Cannon is the novel The Entailed Hat; Or, Patty Cannon's Times by George Alfred Townsend, published in 1884. It was not used in preparing this account. Barclay, E. E. Narrative and confessions of Lucretia P. Cannon. New York: Printed for the publishers, 1841. Hartnet, Stephen John. Executing Democracy, Volume Two. East Lansing: Michigan State University Press, 2012. Fowler, O. S.. Heredity Descent. New York: O. S. & L. N. Fowler, 1843. What a movie this would make! Live about 1/2 hr from this site. Grew up on stories of Patty Cannon. So interesting and we will never know it all. My only addition would be, the skull was returned to Delaware and was housed at a museum in Dover for sometime. Not sure of the whereabouts now, but pretty sure still in Delaware. Great story. Thank you. As of 3/2014 Patty Cannon's skull is on longterm loan to the Smithsonian. Very interesing. It's hard to comprehend such evil, be thankful if you are not. Just watched it too, very interesting yet sickening. I wanted this black hearted woman to be burned at the stake. I just watched her story she was a demon in human flesh its awful and terrifying there are people like that.